My new (hopefully weekly!) links recap format continues! Probably my favourite discovery of the year so far (thanks Erica Gillingham for tweeting about it!) 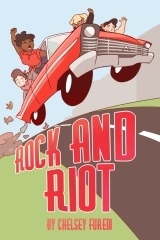 is webcomic Rock and Riot. If you love Grease but wish there were gay, lesbian, bi, trans, non-binary and ace characters, don't miss this!! I was sad to read Jenny Colgan's review of Nadiya Hussain's Secret Lives of the Amir Sisters in the Guardian - I strongly disagree with her idea of books being a 'zero sum game', for a start. Zainab Akhtar's thread on Twitter about the review is a must-read. Given my friend Charlie's AMAZING taste I should clearly watch/read/listen to anything she recommends immediately. Somehow it took this Bim Adewunmi piece on Lovesick to get me to get around to watching it, but I'm so glad I did! Speaking of TV shows, I loved this awesome post from A Life Less Physical on shows to binge watch. I know there are some massive problems with Twitter, and the refusal to do enough to combat abuse is awful. However I think for me, personally, being able to talk to and read the thoughts of so many incredible people has really made me a better person. There's a great post on this from Always Opinionated Girl here. In Glamour Magazine, author Juno Dawson interviewed her mum about Juno's transition - a really wonderful piece. In The Heights just closed after a fantastic run in the King's Cross Theatre (I saw it 9 times; definitely one of my favourite ever shows.) Sam Mackay, who starred as Usnavi, gave a fabulous interview here. And going from one Lin-Manuel Miranda show to another, Hamilton star Phillipa Soo has a great interview here. Fabulous blogger Bookavid has a great list of own voices books by POC authors. And the Daily Beast have a fabulous interview with Vivica A Fox about upcoming all-male stripper show Vivica's Black Magic, which sounds great! Lots and lots of great book recommendation posts recently! I loved Jared's recommendations of his favourite comics from 2016. Looking ahead to 2017, brilliant post by Sue on her 24 most anticipated books of the coming year. And the fabulous Swapna Krishna's wrote an awesome piece for Bustle on 10 Books by Indian Authors To Look Out For. Airy Reads shared some Asian YA/MG books to watch for in the next 12 months. I love this fabulous post on I Live And Breathe Words sharing lots of options for the #DiversityBingo2017 challenge. Speaking of challenges, If you're doing the Read Harder challenge, Book Riot's Rebecca Hussey has an awesome post on classics by authors of colour. I try and read and review diversely, but one thing that worries me is that I don't always pick up on things that could be hurtful to readers. For cis reviewers who want to recommend books about (and especially to) trans people, this list of trans/non-binary books reviewed by trans/n-b reviewers is an incredible resource. Many thanks to Corey Alexander; they have done an amazing job putting it together. For anyone who is considering getting a sensitivity read (which should be anyone writing about marginalised people!) Justina Ireland has a great post here about them. And finally, I loved Shreya Ila Anasuya's piece on India's asexuality networks. Claire, Kay and Chelsea launched awesome podcast Sisterhood of the Traveling Paperbacks! And two very exciting book deal announcements - this one from last month, which I only just saw. The Poet X, by Elizabeth Acevedo, about a Dominican-American teenager discovering the power of slam poetry, is coming in winter 2018 and sounds AMAZING! And just announced, the wonderful Tehlor Kay Mejia will release her debut in 2019, When We Set The Dark On Fire, with revolution brewing in the streets of a world where high society men get two wives. The lead is a young woman at a school where she's trained to be a wife, whose secret sends her into the arms of her husband-to-be's second wife - this sounds fantastic! I posted my second Shorts on Sunday feature, with Katherine Webber - author of the fabulous Wing Jones - becoming my first guest poster on the feature. I also launched my new 'recommendations for secondary school librarians' feature which I'm hoping to run fortnightly. Part 1, with the first 10, is here. On Wednesday, I posted about things I'm trying to do differently in 2017. Thursday's post saw me share my rough (subject to change!) TBR for DiversityBingo2017, along with some recs in various categories. And on Friday I was thrilled when Stripes let me reveal the cover for a book I'm highly anticipated, Katy Cannon's And Then We Ran! Check out the gorgeous cover, designed in-house by Lizzie Gardiner.